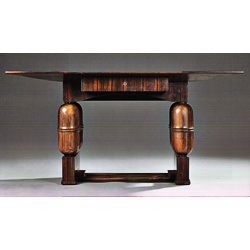 Macassar Veneered Desk by Jacques-Émile Ruhlmann, circa 1923. 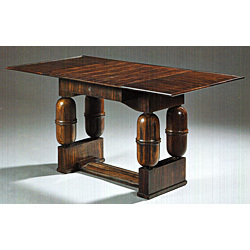 Like much of Ruhlmann’s furniture design, this desk has bold features and striking lines. The desk was discovered locally and was sent to France where it sold for a handsome sum of over $300k. The finish was nitrocellulose and had degraded to a crazed powdery appearance. Importantly, the original finish was stabilised and it was retained, adding authenticity to the desk, no doubt a vital factor in its selling price. The table was made structurally sound before shipping.